Mobile payment options through digital wallets make it easy to pay on the go. A digital wallet is a system that stores payment information and passwords. Digital wallets give you the ability to make mobile payments directly through your phone or other device. Remember that when using mobile devices, data fees may apply. Check with your service provider. You can now add LGFCU debit and credit cards to some of the most popular digital wallets for fast, easy purchases! Apple Pay® – Pay in-store or in-app on your iPhone® quickly and easily. Set up Apple Pay on your device. 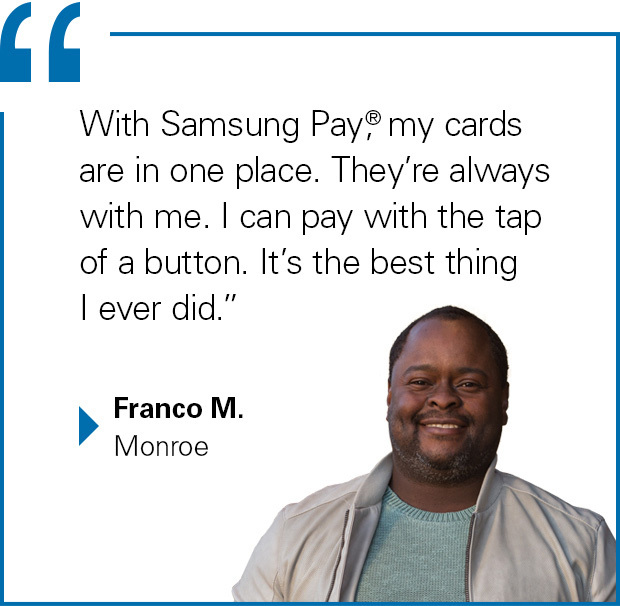 Samsung Pay® – Samsung Pay works anywhere you normally swipe your card for convenient payments with your phone. Set up Samsung Pay on your device. Google Pay® – Make purchases with your LGFCU cards without having to reach for your wallet. Set up Google Pay today. Fitbit PayTM – Leave your wallet behind and easily make payments from your wrist with the Fitbit Ionic watch. Use your Apple or Android phone to set up FitBit Pay. Garmin PayTM – Make purchases on the go with your Garmin Watch. Simply add your card to the Garmin Pay digital wallet on your watch. If you don’t have a smartphone, you can still skip filling out forms and speed through checkout at online merchants. Visa Checkout® – Use at participating online merchants for faster checkout and exclusive deals. Create a Visa Checkout account. Many digital wallet apps use technology called Near-Field Communication (NFC) to let you tap or wave your phone to pay in-store. No more fumbling for cards or cash! While each of these apps differs in how it keeps your information safe, all of them use either encryption or protected code to reduce the threat to your personal data. Many also take security measures like not storing your card numbers in their entirety and offering easy app disabling if your card or device is lost or stolen. Learn more about managing your money from anywhere, at any time. Access your accounts from anywhere with Member Connect. Use Compass for budgeting and tracking your spending.